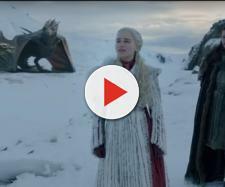 Other remaining mysteries that are still not answered, including the valonqar, Azor Ahai and the Night King. The seventh season of “Game of Thrones” just ended and it will take some time before Season 8 comes out. So far, “Game of Thrones” has shown why Hodor only says “Hodor,” the true parentage of Jon Snow, how he is a legitimate son of Rhaegar Targaryen and that his name isn't Jon Snow. Despite all of that, there are still questions and mysteries that have yet to be answered on the show. In the books, when the young Cersei asked Maggy the Frog about her future. The witch told her that she would marry the King, she would become Queen (until someone younger and more beautiful takes her down), and she would have three children – gold their crowns and gold their shrouds. The last part of the prophecy (that was omitted in the show), was that the valonqar shall choke the life out of her. Valonqar is a High Valyrian word that translates to ‘little brother’ and the popular choice is Tyrion. Cersei also thinks it is Tyrion – thus her hatred towards him. Some fans suggest and theorize that Jaime will be the valonqar – killing her own twin. It will be interesting to see who will fulfill the prophecy, especially now since Cersei is pregnant with Jaime’s child. Other fans have also speculated that the child Cersei’s carrying will be the valonqar – maybe she’ll die of childbirth. In the books, The Prince That Was Promised is implied to be the reincarnation of Azor Ahai. He is the legendary warrior who defeated the White Walkers with his flaming sword – Lightbringer, thus ending the Long Night. According to the prophecy, another Long Night is coming and Azor Ahai shall be reborn to battle the forces of darkness once again. Among the candidates including Ser Davos Seaworth, Jorah Mormont, Beric Dondarrion and Gendry. The two characters that mostly fit the prophecy are Jon Snow and Daenerys Targaryen. Jon was resurrected from death in Season 6, believers of the Lord of Light say that the Lord of Light still has plans for him. The prophecy was originally written in High Valyrian and Missandei has pointed out that the translation is not gender specific, so the Prince can actually be a Princess. In Season 7, Melisandre told Daenerys how she fits into the prophecy along with Jon. She was reborn when she survived the fire of Khal Drogo’s funeral pyre, and she gave birth to three dragons from petrified eggs. The true identity of the Night King is still a mystery, making scarier and more powerful. In the books, he was the 13th Lord Commander of the Nights Watch. In the show, he was a captured Free Man that became the first White Walker. Fans are still speculating on who the Night King is. There are lots of theories regarding his identity, some say it’s Brandon Stark (the Breaker) or his brother who is also named Brandon (there are lots of Brandon Starks). Recently, more and more fans think that Bran is the Night King, which started with Reddit user turm0il26. The theory suggests that Bran, being the Three-eyed Raven, already saw the terrible result of the Great War. So he decided to go back in time to try and prevent the war from ever happening. After repeated attempts, he eventually got stuck inside the Night King’s body.